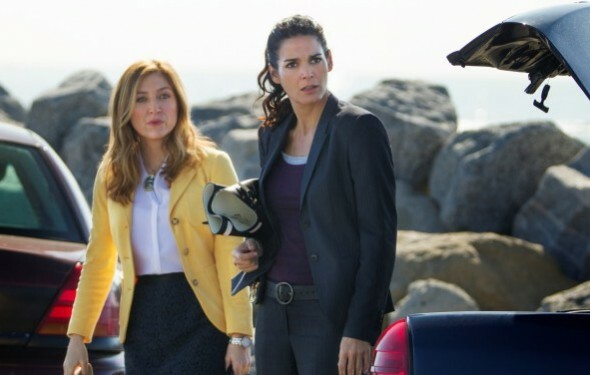 It looks like season eight won’t be on the docket for police detective Jane Rizzoli and medical examiner Doctor Maura Isles. Variety reports that Turner Entertainment chief creative officer Kevin Reilly confirmed that the Rizzoli & Isles TV show has been cancelled by TNT. Though stars Angie Harmon and Sasha Alexander likely would have kept making episodes, Reilly said that, “It felt like it was time.” The current cast also includes Lorraine Bracco, Jordan Bridges, and Bruce McGill. While Rizzoli & Isles remains one of TNT’s top-rated shows, the ratings have fallen quite a bit over the years. The sixth season, which resumes on February 15th, is averaging a 0.7 rating in the 18-49 demographic with 4.35 million viewers. That’s down by about 17% when compared to the fifth season’s ratings. On the plus side, there are still plenty of new episodes to come. There are six more episodes remaining in the sixth season and the show’s already been renewed for a seventh season of 13 episodes. The latter will begin airing in the summer. What do you think? Do you agree with the decision to end the series? Is it the right time or, should TNT keep it going? PLEASE PLEASE rethink this and bring RIZZOLI AND ISLES it back !!! I am dissapointed you are cancelling this show. I enjoyed it very much. I don’t like many weekly series. I usually watch movies. Too bad. loved the show, cant believe its gone,,they should get a vote on it…not just the ratings..do they count when we record it?? I ‘m very upset to see this show go off the air. It is one of my favorites . what will be there as good to watch? Nothing. No I do not agree. your going to lose some viewers on TNT. I’m one of them. see ya.